Cumbria’s Police and Crime Commissioner Peter McCall yesterday joined staff and volunteers in the second phase of their training in preparation for the delivery of courses and interventions for families affected by domestic abuse. Turning the Spotlight is an innovative project that takes a preventative and holistic approach working with perpetrators, victims and their families, using restorative principals to prevent and reduce incidents of low-level domestic abuse. Victim Support has worked in partnership with Craft, a specialist consultancy organisation to develop a Healthy Relationships, Parenting and Partner Support course that will be offered alongside one to one support for those who are experiencing issues within their relationship. 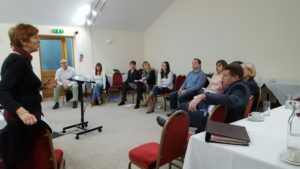 The training event was held at the Stoneybeck Inn, Penrith, by Craft Consultancy and follows a three day multi agency training event held last week. Victim Support has recently been commissioned by the Office of the Police and Crime Commissioner to deliver Turning the Spotlight after the success of a pilot project established over the past two and a half years. Claire Powell, Contract Manager for Victim Support said: “We were delighted to welcome Mr McCall to the event to meet with staff and take part in the training for this exciting range of interventions. Whilst we have been delivering Turning the Spotlight for the past few of years, this is an exciting new phase as we build on our knowledge and experience in our remodeled service. Following the success of the county-wide ‘Turning the Spotlight’ holistic domestic abuse perpetrator prevention programme a decision was made within the Office of Police and Crime Commissioner to commit further funding of £585,878 over two and a half years, to support a further programme. Following a competitive tender exercise, Victim Support were selected to deliver the programme.